The IT Factory, the main sponsor for the Team CSC-Saxo Bank cycling team has gone bankrupt and its director has disappeared. CEO Stein Bagger has been reported missing by his wife after a combined business and holiday trip to Dubai and is now wanted by Interpol for making false signatures and fraud for at least DKK 500 million (USD 87 million). CEO Stein Bagger made false signatures of IT Factory's chairman Asger Jensby in some contracts who requried the signature of not only the CEO but also the chairman. They found documents about some of the fraud business in an until now secret kept office room the CEO had rented at a the Schæffergården conference hotel which is the next door neighbour the IT Factory headquaters. Asger Jensby used to be CEO for the CSC Scandinavia (the company) some years ago but decided to leave CSC in 2001. He was the one who was responsible for CSC's first sponsorship agreement with Team CSC. In September the Danish computer magazine Computerworld gave IT Factory an award as the most succcesful Danish IT Company the past year. After that the magazine wanted to make a profile about IT Factory and write a long article about it. But this is when Computerworld figured out something very supsicious was going on at IT Factory and wrote many articles about how their financial numbers seemed very unreal and their climed customers and business partners unknown. There was a lot of stange secrets surrounding the comapny and who they manged to get their unreal high income. The CEO made a lot of empty promises to the press but in the end he would harldy asnwer them anything of what he had promised. The compnay was stated in 2003 from the ashes of the old IT Factory who went bankrupt in 2003. The only names to business parnerts and customers the CEO would give to Computerworld was two American companies, but Computerworld found out it was highly unlikely that these companies was actually using IT Factory's products at all. Competerwolrd found out they were both run by two to two Swedish businessmen who both has sentencens for business fraud in behind behind them after running a big Swedish IT company to the ground. One of the is not allowed to run a business in Sweden anymore. This is how Computerworld figured out something illegal was probably going on in IT Factory. Riis Cycling has already received their sponsorhip money from IT Factory for the first quater of 2009. Quick! Buy all the CSC stuff now. It'll be collectable! I wish I never got rid of the 80's 7-11 and PDM stuff I used to have. Or all those campy stuff too. Dang it. Well that gives him about 4 months from today to find a new main sponsor. I don't think he'll have an easy go of it as most company's have already allocated their ad money for the first half of 09. I had a bunch of 7/11 stuff, a full kit, and skinsuit, but it just sat in drawer and I never took it out. Ended up giving to a silent auction. I gave my PDM stuff to a buddy, again cause I never used it. CSC stuff is so saturated that I don't think it will ever be a collectible. You guys are not into reading comprehension are you ??? It is not the CEO Of CSC, but the CEO of the Company The IT factory. ok, I should be nicer. "CSC" is a reference to the team, not the company. Seems that you are the one not "into" reading comprehension. Last edited by bdcheung; 12-01-08 at 11:47 AM. Photo ©: Roberto Bettini The newly announced co-sponsor of Bjarne Riis' Danish ProTour Team, IT Factory, announced it will file for bankruptcy. Interpol is seeking the company’s director, Stein Bagger, for economic fraud of up to 500 million kroner (€67 million) after he disappeared following a trip in Dubai, according to a Danish television station. "We do not intend to give up. We have just held a meeting with Saxo Bank, and we agree that we must get out and find a new sponsor," team owner Riis said to feltet.dk. "The riders and staff know that we will not shut down. There is a guarantee that the cycling team will continue." Riis announced in September that IT Factory would be the team's new co-sponsor alongside Saxo Bank as of the 2009 season. The contract, for three years, was said to be for about 40 million kroner (€5.37 million). Saxo Bank is reportedly uninterested in being the team's sole sponsor. The company's chairman and co-owner Asger Jensby confirmed the bankruptcy to the Danish news agency Ritzau. Bagger's wife contacted Jensby when her husband disappeared after the trip to Dubai, according to Feltet.dk. Jensby then checked the company's accounts, and the results drove him to file the bankruptcy Monday morning. Your title of this thread is "CSC is so Farked" which doe not denote Riis cycling. There is no team CSC anymore. they're Team CSC-Saxo Bank until the end of the year. and I think the title of the thread would not be a denotation but a connotation. but that's splitting hairs. Nope it was a denotation you implied directly that CSC was farked. Now if your title was Team CSC or Riis cyling was farked, by a result of thier sponser going bust, Then it would be a connotation. i'm not going to continue this line of off-topic discussion any further. It would be easy to assume that we were incorrectly commenting on the company if we were posting on BusinessForums.net. Since we're on BikeForums.net, the CSC team was the first reference that came to my mind. I dunno about you guys but I never shoot w/o my safety glasses. Especially when I'm at a crowded range (like the one in the photo) and there's a good chance of getting flash, shell casings or shrapnel flying at you from the guys next to you. Now that is a reasonable response. I dunno about you guys but I never shoot w/o my safety glasses. +1. Eyes and ears, always. Even if I'm outdoors. In the meantime, Team GL's sponsorship is paid for. At least Nelson and I paid, I don't know about those other lowlife deadbeats. Exactly correct. Would be sad if one of those guys lost vision in an eye due to poor safety procedures! Does that mean I don't have to be nice to you the next time we ride together? So Bjarne Riis (Mr. 60%) is upset because of fraud and he was lied to? I'm sorry, I promise it will never happen again! Seems that you are the one not "into" reading comprehension. i'm fine, i let it go. 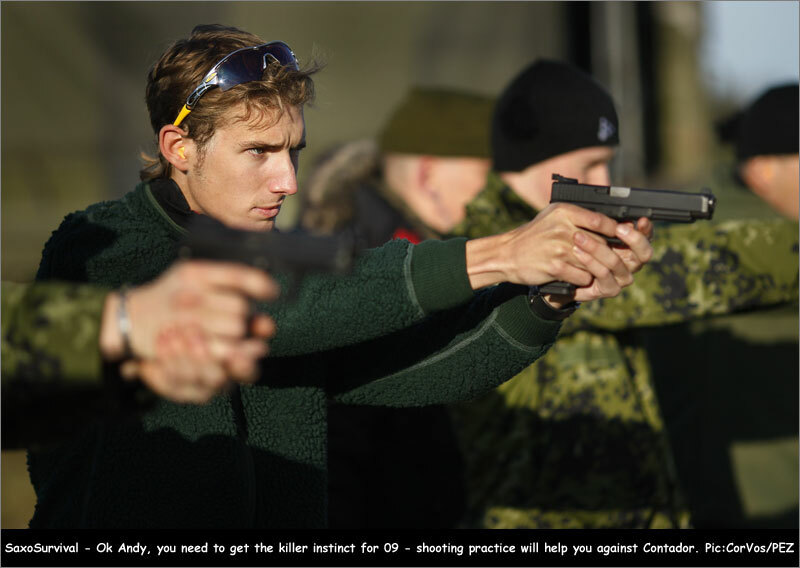 Bjarne ought to hit Glock Inc. up for a team sponsership (it looks like Andy is handling a Glock long slide). The "Glock Perfection" logo would look good on a jersey.